Why couldn’t God defeat Jacob in a wrestling match? Q. Today in my Quiet Time I read in Genesis about God wrestling with Jacob. I was really puzzled where it says, “When the man saw that he could not overpower him . . .” I don’t understand how God could not overpower a human being. God took on human form, but didn’t He still have the strength God would have? What do you think it means? Also, I know God and Jesus have taken human form before, and I was wondering, has the Holy Spirit ever done so? I don’t remember any passages where He does, but are there any? 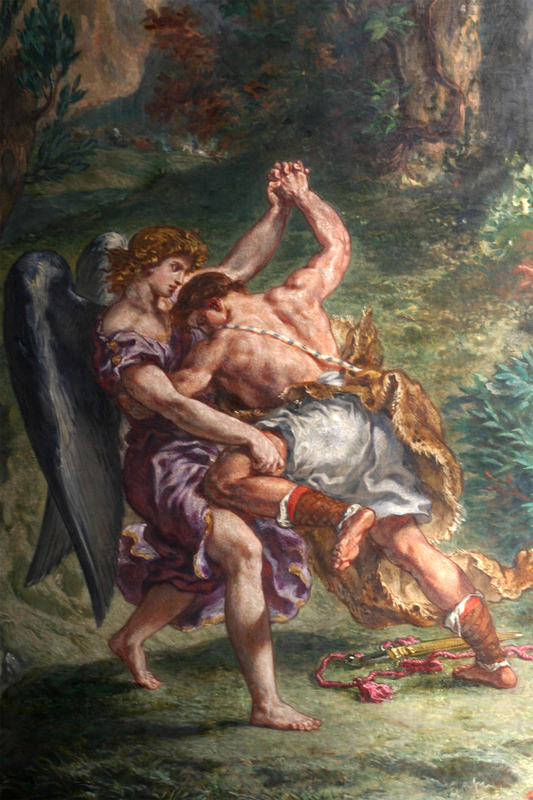 The so-called “man” in this episode who wrestles with Jacob is just like the “angel of the LORD” who appears in other Old Testament passages, though he’s not specifically called that here. He is a “theophany” or manifestation of God on earth. Jacob recognizes this and says, “I have seen God face to face” (in human form, at least). We can only speculate about how the match ever got started. Perhaps the man blocked the route that Jacob wanted to take and Jacob had to try to wrestle him out of the way. Or perhaps Jacob sensed who he was from the start and grappled with him in order to obtain a blessing (just as he says at the end, “I won’t let you go until you bless me”). Rather, I think it means that Jacob, in a desire to get back home from exile (something only God could make possible), determinedly worked through everything in his life that would have kept God from letting him to go back. When he was finally heading home, he testified to Laban about the honesty and integrity he had developed: “I bore the loss myself,” he said, if any of Laban’s flocks were torn by wild beasts or stolen. So we might say that Jacob was “wrestling” with God all those 20 years in exile, striving to become the kind of person God could safely send back to Canaan to continue the line of covenant promise. The wrestling match just before he got back home was a dramatic demonstration of what had been going on all along. God took on human form and limited powers in order to make that demonstration. I’ll answer the second part of your question, about whether the Holy Spirit ever took on human form, in my next post. You have answered my question on what we have been asked in our Sunday School Class. Thanks for the commentary and I will also appreciate were you to develop on the Holy Spirit coming in human form also. This is another “good question” and I will answer it in a new post. Would love to hear more of your thoughts about the Edwards book. It’s tough sledding. I’ll try to do a post soon summarizing Edwards’ book The End for Which God Created the Heavens and the Earth. Perhaps God was unable to flight Jacob in a human manifestation (on the same terms) and then had to resort to his powers to do so. Next Next post: Has the Holy Spirit ever taken on human form?